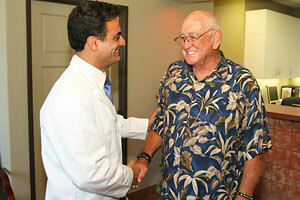 We will show you your options for replacing multiple teeth. Implants can support dental bridges. 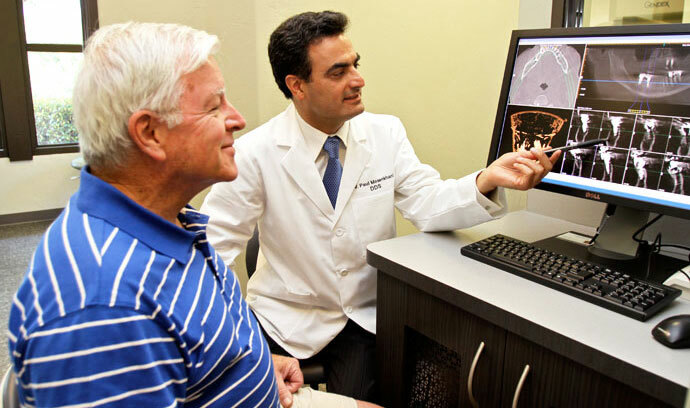 A modern way to replace teeth when several of them are missing is implant-supported bridges. Unlike dentures, bridges are permanently fixed in place and are usually made of porcelain, and not acrylic. Bridges act very much like natural teeth. Implant-supported bridges are similar to conventional ones, but they’re supported by implants rather than natural teeth. Implant-supported bridges can be created in various combinations. Each set of dental implants can generally support up to three replacement teeth. For example, three missing teeth can be replaced with two implants supporting a three-tooth bridge. Five missing teeth can be replaced with three implants supporting a five-tooth bridge. In the past the only way to replace many missing teeth in a row was to use a partial denture. A partial denture has many drawbacks, especially when it comes to talking and chewing. And a partial denture doesn’t prevent bone loss, either. 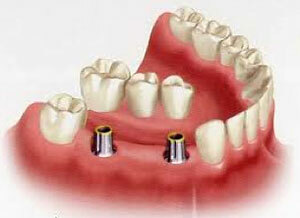 We use implants to anchor your partial dentures because they don’t slip, are more comfortable and need no adhesive. Implant-supported partial dentures are also an option for people having teeth extracted, and are a much more affordable option than full dental implants. And they help prevent bone loss, too. Implants are placed in strategic locations and are connected to the partial denture by means of a stud or clip screwed into the denture. A denture can be stabilized with as little as two implants in an arch. The more implants used, the greater the stability and support. More implants can also give a more tooth-like appearance and feel to your dentures while reducing or eliminating the display of metal clasps and parts. We can also eliminate the pink plastic sides and let the artificial teeth to emerge from the gum just like natural ones. 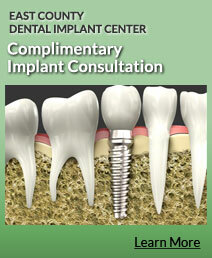 We offer a complimentary consultation to see if you are a candidate for dental implants. We will conduct a comprehensive consultation in which we will get the basic information needed to formulate a treatment plan with several options, and to discuss your goals and answer any questions. “The entire experience here is very pleasing. The atmosphere is friendly and engaging and the staff is very competent.